We knew this was coming based on the report a couple weeks ago, but it appears artist Lina Iris Viktor has officially taken legal action against Kendrick Lamar & SZA and have sued the two TDE artists for ripping off her artwork in the “All The Stars” video. 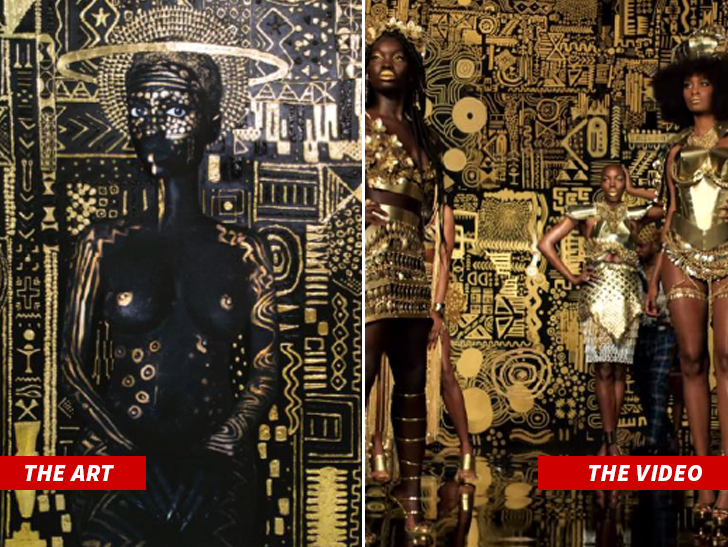 Lina Iris Viktor claims her fine art titled "Constellations I," "Constellations II" and "Constellations III" are being used in K. Dot & SZA’s Black Panther video "All The Stars," despite refusing its permission TMZ reports. Viktor says the video tries to mimic the "unique look and feel" of her works, but also uses "specific copyrightable elements" such as "stylized motifs of mythical animals, gilded geometric forms on a black background, and distinctively textured areas and patterns. In an addition to all this, Viktor says the new Marvel movie promotes themes of black and female empowerment, which she happens to be, but yet still ignored her wishes. She's suing for damages and she wants an injunction prohibiting Kendrick and SZA from using her artwork to promote the soundtrack. We’ll keep you posted on this developing story, but in the meantime peep the photo comparison of Viktor's work & the video (below). Lil Skies Says Gucci Mane Collaboration Is "Dropping Soon"